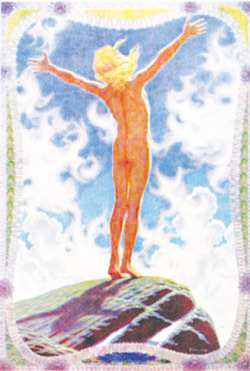 Another technique used by Thutmose III and members of his order was the use of healing rods while sungazing (see Figure 1). These were copper and zinc tubes that contained hardened coal and magnetite respectively. They were reintroduced to the world by the Russian mystic Count Stefan Colonn Walewski, who was a member of a sungazing mystery school in the Caucasian Mountains. They amplify the current that passes through the body between the sun and earth while sungazing, enhancing meditation and quickening healing and the development of psychic powers. In 1369 BCE, Amenhotep IV took over the reins of Egypt from his ailing father Amenhotep III. During his upbringing, he was educated at the Temple of the Sun at On (Heliopolis) where the priests instilled in him a devotion to Aton. When he became pharaoh, he was given the secret mysteries of the sun handed down from his great grandfather. He learned that Aton was the one true, self-created, unmanifest God and that most of the other gods, including Amen-Ra, were man-made. Early in his reign, he changed his name to Akhenaton, meaning “the servant of Aton.” Unlike his great grandfather, he had no tolerance for spiritual ignorance. 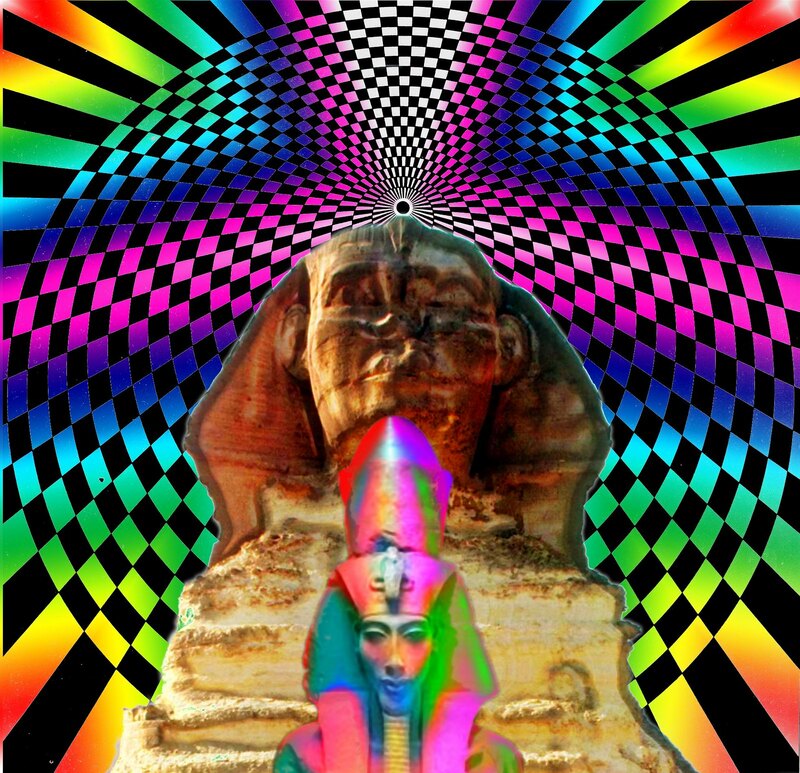 Akhenaton initiated a change in the religious climate from a fear-based polytheism with its death cult, magic amulets, numerous idols, animal sacrifice, and secretive rituals of a powerful priesthood to a more devotional religion, which was free of graven images, obsession with the afterlife, and magic; which emphasised reverence for sunlight and cleanliness, and simple burial; and which allowed ordinary citizens to freely worship in open-air temples with offerings of fruits, flowers and incense, as was done in the original solar religion of Egypt. Aton’s temples had no idols or graven images other than the one Akhenaton devised – a sun disk from which proceeded rays, the ends of which terminated in graceful hands. Some of these hands held the ankh, the symbol of life, to the nostrils of his sungazing worshippers. This symbolism shows that Akhenaton understood the relationship between sunlight, prana and breath. He knew that sunlight is the source of all life upon earth. This was not worship of the physical sun but worship of one God, a supreme deity, whose spirit was in heaven and whose physical manifestation was the sun – the symbol of life. It changed the worship of the sun as a god to the worship of God symbolised by the sun. Paintings and carvings of Aton were always accompanied with a sort of hieroglyphic footnote (seen at the top of Figure 4, page 56), stating that it was just a representation of the All-encompassing Creator. In The Secret Initiation of Jesus at Qumran, Robert Feather shows how the descendants of these Egyptian priests, originally appointed at the time of Akhenaton, could have maintained their cohesion down to the beginning of the Qumran Essenes (610 BCE). When they entered Canaan, they settled around Shiloh and so became known as Shilonite priests. They became prominent around the time of Ezekial (589 BCE), Onias IV (160 BCE) and Jesus (4 BCE). These were also times when the Essenes were active. The Qumran Essenes, based on the Shilonite priests, came to have a much purer Judaism that rejected animal sacrifice, idols, amulets and burial with worldly goods which crept into the Judaism of the rest of the Israelites. During the Exodus, these priests were pro-Moses and against the priests of Aaron. It is likely that the priests of Aaron, who backslid into idolatry of the golden calf (the Egyptian goddess Hathor) while Moses was on the mountain, may have been responsible for reintroducing another Egyptian practice of holocaust sacrifice, prohibited by Atonism. On Mount Sinai, God gave Moses the first set of tablets to present to the Hebrews. Figure 2 (page 55) is a detail from a painting by Beccafumi. It shows Moses receiving the tablets from the sun, which is depicted as an opening in the sky. The receiving of this fire through sungazing with arms upraised in a Y formation or bent at the elbow and hands spread out and facing the sun was called by the Greeks “fire blooming” because the radiance or essence of the sun thus channelled burned away impurities in the solar plexus, which, by the way, is associated with the sun and with fire. One can find wall carvings, paintings, statues, woodcuts and photographs of sun worshippers from all over the world – Hindus, Muslims, American Indians, ancient Egyptians, Medieval monks, Russians, Incas, and even aborigines in prehistoric petroglyphs – all with upraised arms. William Henry wrote in Mary Magdalene: The Illuminator that when Jesus taught his disciples the Lord’s Prayer, he also taught them this prayer position, which he learned from the Egyptians, who called it the Ka position (Figure 6, page 57). Moses also learned it from the Egyptians and used it to invoke the Light of God during the Israelites’ battle with the Amalekites. Significantly, the battle was won at sunset. Clement of Alexandria recorded that Paul, before going to Rome, said that he would bring to the brethren the Gnosis, or tradition of the hidden mysteries, as the fulfilment of the blessings of Christ, who, Clement says, reveals the secret knowledge and trains the Gnostic by mysteries, that is, revelations made in the state of higher consciousness. Such a state can be attained through deep meditation, chanting and sungazing. Unfortunately, Paul was arrested in Rome and a few years later executed. His true teachings on the mysteries of the sun were lost for several centuries until they were resurrected in Armenia and Syria during the late seventh century by the Paulicians. This group was so named because their teachings were the Gnostic mysteries handed down from St. Paul when he brought them to the Balkans and Syria during his ministry. The Cathars “pure ones” and the Knights Templars were concentrated in the Languedoc and Midi regions of Southern France. The Cathars claimed to possess the Book of Love (AMOK) the original initiatory version of the Book of John (the only gospel the Cathars, Knights Templars and Bogomils read) which likely contained the solar mysteries. It taught that a spark or tiny sun of the Christ Light dwelt in man’s heart and it revealed how to nurture it like a seed of divinity so that it blossomed into the rose of the original rosy-cross mystery school. This teaching, which reputedly could transform a human into a divine being, once belonged to Thutmose III, Akhenaton, Moses, Solomon, Jesus, and John the Beloved. It was reputed to be able to dissolve all hatred, anger and jealousy from the hearts of men. William Henry, in Mary Magdalene: The Illuminator, wrote, “All the occult mysteries speak of a key that is required to unlock mystical secrets of enlightenment. Specifically, the lost secret of the Templars… is about building a better human through the release of secretions from the astounding manufacturing plant of spiritual oils, the human brain. This oil or essence was the key secret of Mary Magdalene and the Essenes, recovered by the Templars from between the temples. The skull [specifically the third ventricle] is… the Cup of Life, the Grail, that catches these secretions from the brain… The Templars’ ultimate objective was to restore true Gnostic monotheism to the world, uniting Christianity, Judaism and Islam in a New Kingdom of Heaven on Earth. The ‘new’ humans that inhabited this New Jerusalem (or New Atlantis) would know and embody the secret of the Kingdom of Heaven within the brain and its capability of producing… the elixir of life, the Sacred Soma, the tonic of immortality, for these terms all refer to the cosmic essence or brain substance.” It was also called Christos (anointing oil) by the Essenes. Omraam died in 1986, but his teachings on the mysteries of the sun live on in numerous books. Over 90 books have been published in English, and there are enough notes from his hundreds of lectures to fill another 400 books. Of these books, the ones that are primarily concerned with the mysteries of the sun are The Splendour of Tiphareth: The Yoga of the Sun, Toward a Solar Civilization and Light is a Living Spirit. Louise-Marie Frenette’s newly-released biography of Omraam Mikhael Aivanhov, The Life of a Master in the West, has just been published in New Zealand by First Edition Press (to order call +64 (04) 586-1973). Today, his teachings and sungazing rituals are practiced by the I.D.E.A.L. Society, The Hearts Center and other spiritual communities around the world. .WAYNE H. PURDIN is past president of the International Sun Imbiber’s Society (ISIS), editor of The Sun Gazette, and director of the Phoenix Hearts Center. He has recently written The SOLution: Laying the Foundation for a Solar Civilization. Wayne is also an instructor at New Wisdom University, www.newwisdomuniversity.com. His website is www.suncenterofphoenix.com and he can be reached at wpurdin@gmail.com. The above article first appeared in World Explorer 37 Vol. 5 No. 1. and appeared in New Dawn No. 113 (March-April 2009).